During my first few years in New York City, Heather and I lived in Long Island City, Queens – right across the East River from Midtown Manhattan. In addition to an amazing view of the city from our 20th floor apartment, we also had the ultimate spot to celebrate the Fourth of July. With the Macy’s fireworks barges parked in the middle of the river right outside our windows, we could see (and feel) the shells exploding right in front of us. Since the financial crisis, they seem to be scaling back the show each year, reducing the number of barges and moving from the East River to the Hudson River. Instead of hosting the fireworks spectacular on the East River – a central part of the city surrounded by Manhattan, Queens, and Brooklyn, they now are on the West Side and better seen from New Jersey! 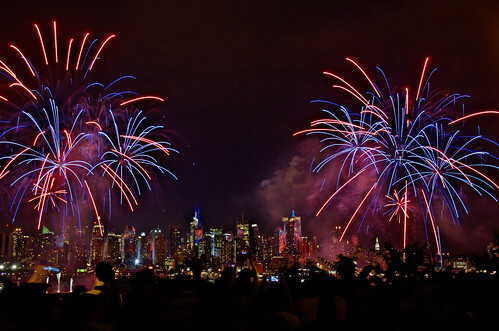 Last year, we decided at the last minute to check out the Macy’s Fourth of July fireworks from Weehawken, NJ. When we lived in Long Island City, a last minute decision like this was impossible – the best spots were claimed by noon in Gantry State Park, with spectators sprawled out in lawn chairs and enjoying picnics from their coolers. Since we were driving, we parked at the Tonnelle Avenue Hudson-Bergen Light Rail (HBLR) station. There were still plenty of parking spots at the station, even when we arrived around 7:30 pm. Four barges on the Hudson River provided a dazzling synchronized show. Photo by Randy Le’Moine Photography, on Flickr. It’s only three stops on the HBLR to Lincoln Harbor. If you are travelling by public transport from elsewhere in the city, you can connect with the light rail at Hoboken Station, where it’s possible to change to the PATH or NJ Transit mainline trains serving Manhattan, many parts of New Jersey, and the Hudson Valley. Macy’s uses four barges floating in the Hudson River, positioned between 23rd Street and 42nd Street. Lincoln Harbor in Weehawken puts you directly inline with 34th Street, right in the middle of the action and with the brilliant Manhattan skyline as a backdrop. Interestingly, Macy’s does not even mention the fact on their website that you can view the fireworks from New Jersey! There was plenty of space along the waterfront, and we were able to secure an unobstructed view at the Weehawken Waterfront Park. Bring a radio to tune into the simulcast broadcast available on AM 1010 WINS and 102.7 Fresh FM. The show starts at 9pm and features tens of thousands of shells synchronized to a patriotic score. It usually lasts about 25 minutes. Only from the Jersey side can you get a backdrop like this. Photo by jbylund, on Flickr. We were shocked that it was so easy to get such an amazing view of the fireworks at the last minute. For the best place to watch the Macy’s Fourth of July Fireworks, we definitely recommend the waterfront at Weehawken, New Jersey. If, however, you insist on staying on the Manhattan side of the river, follow the hoards of people over to the West Side Highway. Instead of the beautiful New York City skyline, you will have New Jersey as your backdrop.